Sam and Dani Johnson, owners of the dogs shot in Eagle Rock last month, protest weekly, demanding charges be filed against the dogs’ shooter. Last weekend, they were joined by their daughter, her husband and their grandchildren from Ft. Riley, Kan. Pictured above, from left to right: Tiffany May; Kendra May, 9; Dani Johnson; Luci May, 10 months, Dallas May; Jax May, 5; and Sam Johnson. For four weeks, protests have taken place weekly across Barry County advocating for three dogs shot to death in Eagle Rock. The protestors stand with signs demanding justice and asking for charges to be pressed against the alleged shooter. Protests are planned to continue until charges are filed through the Barry County Prosecuting Attorney’s office. Barry County Prosecuting Attorney Amy Boxx finally released a statement regarding possible charges for the shooting deaths of three dogs in Eagle Rock last month. The statement came out after four weeks of protests demanding charges. The incident on March 13 Boxx is referring to is the shooting deaths of three dogs belonging to Dani and Sam Johnson, of Eagle Rock. The Johnsons believe they know who tortured and mutilated their beloved labs, but so far, no charges have been filed. The Barry County Sheriff’s Office concluded their investigation and turned their findings over to Boxx less than a week after being alerted to the allegations, according to Barry County Sheriff Gary Davis. Dani said she is grateful for the work the Sheriff’s Office did for her. “I think Barry County got a lot of calls. They did do their job. I’m impressed. I got to see a copy of the police report and they wrote down exactly what I had hoped they would do, which is the mutilation and torture. I believe they got a bad rap in the beginning, and they did their jobs,” she said. Protestors have gathered at different sites throughout the county each Saturday beginning March 31. Protestors say they will continue to protest until charges are filed against the person responsible. The first protest took place outside the driveway of the alleged shooters, the owners of Paradise Cove Camping Resort in Eagle Rock. Since, protests have taken place at the Barry County old courthouse in Cassville twice, and this past Saturday, at Highways 86 and Route J in Golden. Protestors hold up signs, demanding justice, and all wear orange to stand in solidarity for the death of the dogs. The dogs were wearing orange collars when they went missing, but those collars had been removed when the Johnsons found their bodies. The group has been called Justice for Gus and Dog Lives Matter. 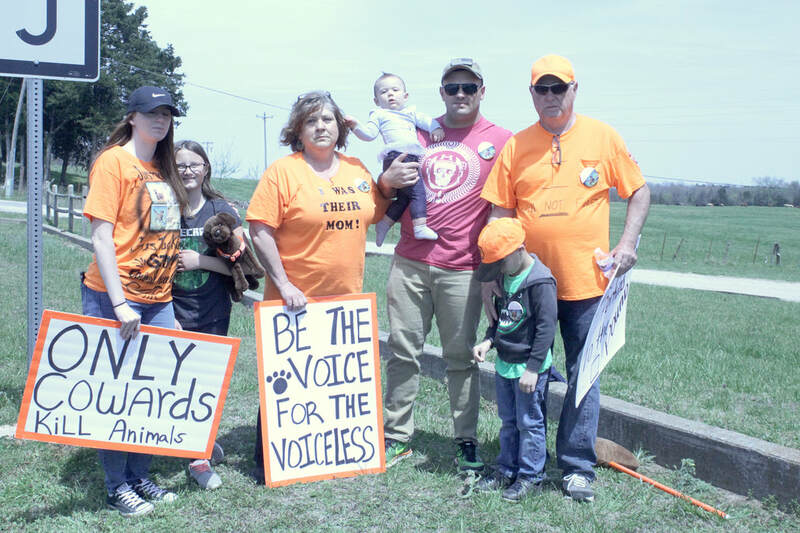 Sam Johnson and his brother also went to the Missouri State Capitol for the Missouri Alliance for Animal Legislation’s Human Day on April 10 to try to bring awareness to issues like these. Dani said, “People were there to talk to legislators about animal cruelty. They were able to talk to representative Scott Fitzpatrick, and he said he would make a call to Amy Boxx to discuss it. “They also had an opportunity to speak with Senator Sater, and they were very receptive. They were pleased with the response. Dani said the protests will continue weekly until charges are filed against the shooters responsible for her dogs’ deaths. Calls placed to Paradise Cove for comment were not returned.